Sea bream (US: porgy, scup). 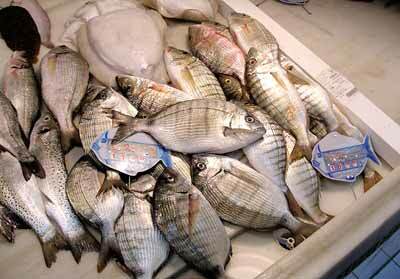 A large family of fish which includes black sea bream, bogue, Couch’s sea bream (known as red porgy in North America), dentex, gilt-headed bream . They are usually sold weighing up to 1 kg (2 lb). All have a deep, narrow body, small mouth, big eyes, quite large, tough scales, a single, spiny dorsal fin and a black spot on the shoulder. They are good to eat cooked whole, stuffed and baked or braised.